Technical analysis of stocks is the study of the historical data of stocks, including volume and price. The aim of technical analysis is to use past behaviour of stock to predict the future price. In a volatile equity market, every investor wants to use the best method to analyze the stocks. Technical analysis is generally used to capture the markets up and downs in coming one or two weeks. It is the analysis of short period price prediction. 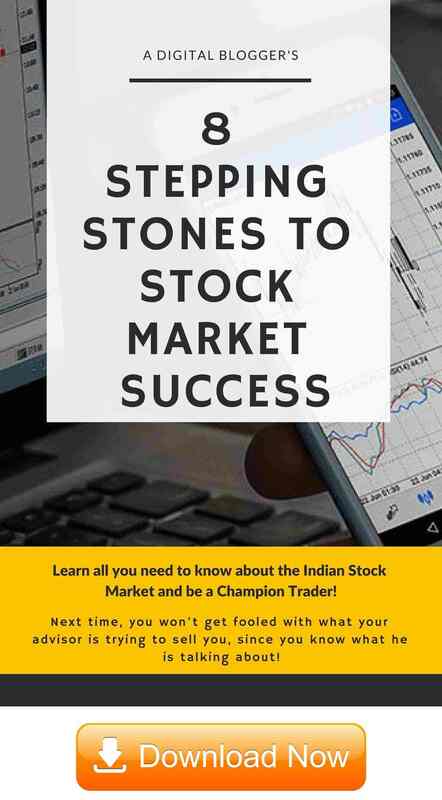 Technical analysis of stocks is a method of analysis of stocks by using historical chart pattern of stocks which are publicly available. This method of analysis is mainly associated with equity but can be used for some different types of securities also. In other words, Technical analysis means predicting the behaviour of the stock price by looking at the previous trends of price and volumes by using their charts and other technical indicators. It is generally used by short-term traders who want to make quick money by observing patterns in stock prices. They do not concern themselves with the overall health of a company and are not interested in knowing the fundamentals of the company before investing in it. Technical analysis evolved from theories of Charles Henry Dow, who is known as the Father of Technical Analysis. Behind this whole concept, there are three Dow’s theories which serve as the basic assumptions behind technical analysis. How Technical analysis is different from Fundamental Analysis? Fundamental analysis focuses on a company’s financials, management, economic policies etc. to do an analysis. With a change in numbers of financial, future stock price prediction changes. It is the most common method used by market participants to analyze a stock. On the other hand, the Technical analysis focuses on past price chart patterns and predicts the future price of the stock. Both fundamental and technical analysis is used for future price prediction of stocks but takes different data into account for analysis. As per this theory, all the factors that can have an impact on the stock prices have already been discounted in the current stock price. Therefore, it is safe to assume that the current stock price is of fair value. It is neither underpriced nor overpriced. This underlying assumption means that the price movements of any stock can be charted and predicted. Although there are some random movements, however, the stock market is also full of identifiable tends which, if spotted, can make huge gains for the traders. The whole theory of technical analysis revolves around “Trends“. This one seems quite obvious after reading the first two assumptions. Technical analysts believe that people react to price movements in remarkably similar ways. For example: In bull markets, traders want to earn more and more and thus, keep on buying despite high prices. Similarly, in bearish markets, people have negative sentiments and focus on selling even though the prices at that time are quite low. Open: This is the first price at which a trade gets executed when markets open in the morning. High: This is the highest price at which a trade could be executed during the trading day. Low: This is the lowest price at which a trade could be executed during the trading day. Close: This is the last price at which the markets got closed. This is an important indicator of whether the day had been bullish or bearish. 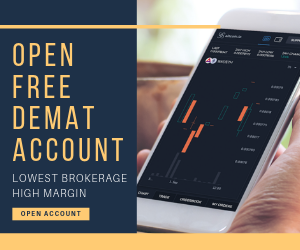 If the open price is lower than the close price, the day is considered to be a positive day and if the close price is lower than the open price, the day is considered to be a negative one. 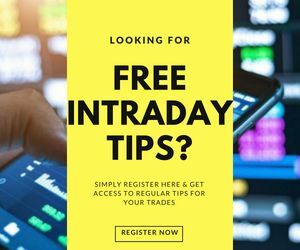 Technical analysis of stocks – How to do it? Following are seven important steps of technical analysis to understand Dow’s theories of technical analysis. Dow’s theory is Charles Henry Dow’s theory, who is the founder and co-founder of the wall street Journal and Dow Jones and company respectively. Three of Dow’s investment theories are a good guide to technical analysts. According to the first theory; the stock market reflects all known information. Known information refers to all those information which are available by any means publicly. Technical analysts don’t take any financial information into account for analysis. They don’t relate themselves to the price-to-earnings ratio (P/E), Return on equity ratio, shareholder equity or any other ratio like fundamental analysts. According to this theory the price movement of stocks can be predicted and charted. Everyone knows Price moves randomly and there is not a fixed pattern. But as per theory, this case is not always, price movement repeats itself sometimes or moves in a known trend. Once you understand the trend, it’s quite possible to make money. You can go with the strategy of buying at a low price and selling at a high price. Also, you can make good positions for future trading. This theory tells that the history of stock market repeats itself. Means investors and market players react in the same way as they reacted in the past because of the same situation, news or company announcements. So, Technical analysts use their knowledge of how trader reacted in the past and what was the effect on the stock. Technical analysis of stocks focuses on the short period of time like as long as one month and shortest of one minute also. As the purpose of the fundamental analysis is an investment for long-term, but in technical analysis, the focus is for short period. If you want to make money in a short period or buying and selling repetitively then this method of analysis best suits you. Technical analysis of stocks uses charts and graphs to read spot price trends. A chart tells you a lot about the trend of price movement. Where the current price of a stock is heading can be easily predictable through charts. Trends can be classified on the basis of duration and types. Upward movement is known as uptrend. Everyday stock price moves towards a new high and then falls to low as they did previously. You must know that this upward movement at its high is not lifetime high, but it could be high of last day, week or month. This steady high and low of price reflects that market is positive about the stock. It is an indication that one can buy this stock as this is on an upward trend. So, every time when a stock falls, investors take it as a chance to buy. They don’t wait for the price to fall further. Downtrend refers to a pattern, where stock price falls continuously. 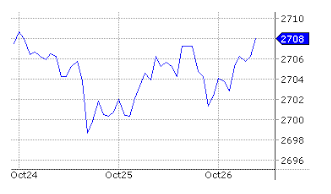 You can notice not only peaks are lower but troughs are also lower. It means market players are convinced that the stock price will fall further. So, investors wait to a little rise in the price to sell their existing positions. At this point of fall, investors never prefer to buy further because of its downward trend. If you are short term investor then it will be a loss-making position for you, but if you are a long-term investor you may wait for a little more price fall. A horizontal trend is a trend in which there is no fix trend. Only peaks and troughs are constant. But, you can’t decide where to buy or sell a stock. Support and resistant are two concepts of price movement in technical analysis of stocks. Price of stock stops and reverses at a certain predetermined price level. Support is a price level where a downward trend of price movement is expected to stop. At this point the price of stock falls and demand for the stock increases which forms a support line. Resistance refers to the highest price of a stock where it reaches before traders start selling and stock price to fall again. Once the area of support and resistance is identified, trading will be easier for you. As if the price reaches any of these points, there are two possibilities. First, it may beak that level and go upward or downward. And, second bounce back away from any of two levels. To be confident about the trend of stock price, volume of trades must be watched. You can get much information about what is actually happing in the market through trading volume. If the volume increases with the increase in the price of the stock, the trend is probably valid. And, if the volume of trade increases slightly, probably it is due to reverse trend. Moving average is a technique to get an idea of a set of a trend. It is useful for forecasting of long-term investment. This method removes unnecessary highs and lows to make overall trend visible clearly. There are many methods for moving average. Such as Simple moving average, weighted average and exponential moving average. Indicators is a calculation of technical analysis which supports the trend of information of price movement. It helps you to come to your decision to buy and sell. Leading indicator is useful during a horizontal trend when the movement of the stock is not fixed. Line Charts: They are plotted by joining closing prices of any stock or index. They can be prepared by checking closing prices on monthly, weekly and even hourly basis. Bar Charts: Bar charts depict all the four key prices of the day, namely, open, low, high and close. The picture below shows how a bar chart can be made and how it shows a positive or negative sentiment during the time period. The real body: It is made by joining the open and close prices. The bodies of bullish and bearish candles are depicted in different colours. For example: in the picture above, we are using white colour for the bullish candle. i.e. when the open price is less than the closing price. And, black colour is being used to show bearish candle where the close price is less than the open price. Upper shadow: It connects the high price to close price in case of a bullish candle. 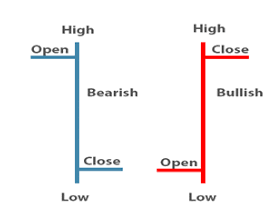 Similarly, in case of a bearish candle, it connects the high price to the open price. 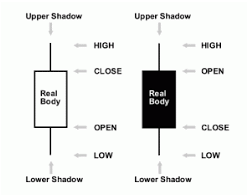 Lower shadow: It connects the low price to open price in case of a bullish candle. Similarly, in the case of a bearish candle, it connects the low price to the close price. Candlesticks are easy to interpret and can be made for different time frames like monthly, weekly, daily or intraday charts. They make certain patterns which help in predicting the future price of a stock or index. There are numerous types of patterns of candlesticks that we will be discussing as a different topic in another post. 4. 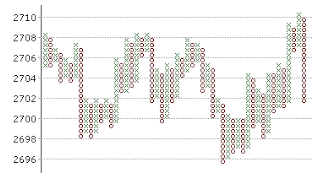 Point and Figure Charts: They depict price movements without considering the passage of time. They consist of X’s and O’s that represent price movements in different directions. X’s represent a rise in prices. O’s represent fall in prices. One X on a graph means one price unit rise and one O means one price unit fall. If a stock price unit has increased four times, a column of 4 X’s is plotted. Therefore, X’s and O’s can never appear in the same column. Please see the picture below for more clarity. Before we end this piece on Technical Analysis, let’s just quickly revisit the different theories around the very concept itself. Understand clearly about all three investment theories of Dow. Try to look for a short period of results. Try to understand the trends of the stock. Get an idea of support and resistance. Know about the trade volume in the market. Get the overall idea of the trend by using moving average method. Use Indicator and oscillator which Supports what price movements are telling about your decision to buy and sell.